You are here: Home » Etiquette » Shorts and The Modern Gentleman, do the two mix? Few items in a man’s wardrobe seem to elicit as much questions as shorts do. From what types of to wear, the length of the shorts and how should I wear them. There are those who feel that men can wear shorts all the time from the winter season to the summer season, they just love them. Then you have those that feel men should not wear shorts at all. If I had to choose one extreme I would wear the shorties all year round. But since we are not extreme we will offer some much-needed guidelines on the how, what, where, and why of wearing shorts. Guidelines that based on what I see in the streets need to be followed. Shorts as a piece of comfortable, casual summer wear for men did not become fashionable until the 1950s. Even then the idea of men wearing shorts took a long time to catch on as fashionable there are still plenty of men alive today who remember them being basically clothing for young boys. Nowadays when a man can leave an air-conditioned house to get in an air-conditioned car and drive to an air-conditioned building this man can wear pants mostly. This could leave a man thinking why even bother getting multiple pairs of shorts. During the summer months you will be outside doing outdoor activities, and it is not a good idea to only have some athletic shorts only. So let’s get into these guidelines in which we speak about when and how to wear shorts. Shorts should be a staple of a gentleman’s summer wardrobe. So when to wear them? Wear shorts when there’s a good reason to i.e…When it’s warm, you are outside, at a casual event, or any time you can afford to dress down. Recreation with family and friends is always a good time to wear them. Do not wear them when attending a formal ceremony/event, or conducting formal business not on a golf course. Never wear shorts with a sports coat or blazer or anytime a blazer or sports coat is expected. Just remember if wearing shorts when traveling the world, it may mark you as a tourist and may draw unwanted attention. Now let’s move on to how to wear shorts correctly. (This is needed). As a lesser-worn piece of menswear, shorts prompt all kinds of questions: How long should they be? How baggy? How many pockets? Belt or no belt? There are many issues and guidelines that are necessary to stay as a modern gentleman. First let’s take a look at the different types of shorts. Each type of shorts needs to be worn similarly. We will first go over some basic rules and we will hit each of the above types of shorts. How Long Should Shorts Be? Anything past the knees has ceased to be “shorts.” Those are high-cut pants, which is something else entirely called Capri and no gentleman should be wearing those. Shorts that do come up to mid-thigh should be limited to lightweight athletic shorts, and should only be worn in athletic settings. Running shorts get more leeway than casual ones because the expectation is that you’re not going to walk into a store or restaurant wearing them. Exercise devotees should bear this in mind, and should go home and change (and shower) before inflicting themselves on the public outside of gyms, courts, or bike paths. Shorts should lean towards a slim fit. The key here is to buy a slim fitting pair that don’t bloom out at the bottom. You want your short to be consistently slim. You should have a bit of space to breathe but not a lot of excess material flapping around. Below is how different lengths look. It’s obvious that there are some shorts a gentleman should not wear. Pay attention to length, much like you would not wear pants that are too short, you don’t want shorties that are crotch huggers. The picture on the left should never be worn. The picture on the right is o.k. but, a modern gentleman should wear the one in the middle. What type of belts to wear? These should obviously always be belted. This is probably the easiest and most lax guideline. You can wear any belt but shorts look best with a canvas and leather belt. Now that you know the rules of picking a great pair of shorts, it’s time to go over other shoes and socks that compliment really well. This is extremely important. As we will see below wearing the wrong shoes can destroy your outfit. Make sure with all your footwear you’re wearing a pair of no-show socks. You can go sockless but remember that there are some things you need to have done. First make sure your feet are clean and manicured, Second, you need use some foot powder so your feed do not sweat, you do not want to have an odor when you take your shoes off. 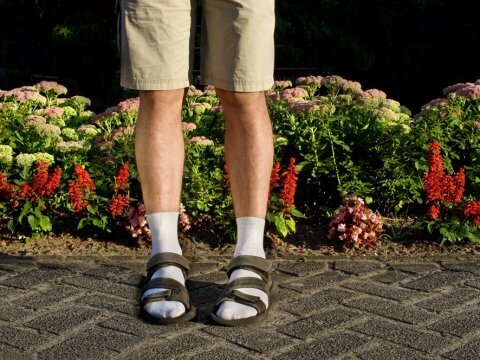 Now if you’re wearing sandals, which are what you’d expect when it’s hot enough to need shorts, skip the socks. Nothing says old man and out of the loop than wearing socks with sandals. Do not wear sandals to any place but the most relaxing locations, the beach or a pool party is preferred. Shorts are casual, so the shirt should be too. Don’t wear a long-sleeved, button-fronted, collared shirt with them. Even with the sleeves rolled up it’s too much of a stylistic mix-and-match. Collared polo shirts, collared button up short sleeve shirt, Henley shirts and t-shirts all can be worn with shorts. Use the shirt as the focal point of the outfit. Athletic should only be worn in athletic setting. As a gentleman you should not walk into a store or restaurant wearing them. These can be a little longer but cannot be any shorter than right above the knee. Exercise devotees and gym rats should bear remember this, and should go home or take the time at the gym to shower and change before heading out to the public just because you enjoy the gym smell does not mean others do. Only wear athletic shoes with these types of shorts. Cargo shorts” or safari shorts with side, front, and back pockets used to be all the rage, especially in urban settings. But much like parachute pants these have outlived their time. These are great for hiking, camping and where you will need multiple pockets. These baggy, multi-pocketed shorts don’t look great in social settings and screams out I am trying to be cool but really am out of touch. 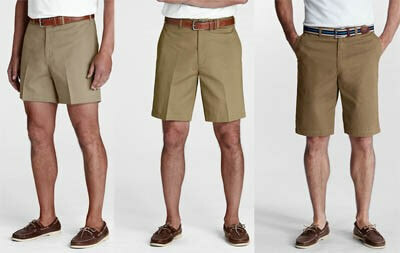 Solid colors such as tan, khaki, white, navy, olive, and off-white are the most traditional styles for men’s shorts. This summer the hot color is pastel and there are a lot of cotton and cotton blend shorts that fill this need. Get the flat front shorts and do not put a pleat in the front by ironing. Plaids, especially plaids with a white base should be paired with at least a polo shirt or a tee-shirt and you will not look like a 1980’s yuppie. Wear a brighter color you can take things from boring to eye-catching. Jorts were once considered nerdy or something only dads would wear, but in recent years have become very popular. A pair of denim shorts will definitely look more appealing when fitted to the leg, as opposed a loose board short fit which can look quite sloppy so no baggy jean shorts. You should also consider going for a higher cut or even putting a hem or cuffing gives a nice look. An inch or two above the knee is as high as you should go. Shorts worn with closed-toed shoes usually look best with no-show socks do not wear ankle, mid calf or knee-high socks. Do not wear black socks. Shorts should not go to the calf, those are called Capri’s and men should not be wearing those. Since you are wearing shorts do not fall into the trap of wearing flip-flops particularly the thong flip-flops. These should not be worn outside the beach or pool areas. Wearing shorts is for the modern gentleman and is one of the best ways to beat the summer heat and look stylish while doing so. You can fill up your closet for not too much money. Shorts can fit into many occasions that the modern gentlemen find themselves in during the summer. So don’t be afraid to show those legs and calves this summer. Just make sure you take care of those legs.